Sharon McNight stars at Seven Angels Theatre in the show she wrote about Sophie Tucker, Connecticut’s own Red Hot Mama, who enjoyed fame from her Burlesque days to Broadway and beyond. We asked her to discuss the star and this role of a lifetime. CTAC: How were you first drawn to write this show about Sophie Tucker? CTAC: Do you see similarities between her performance and your cabaret shows? CTAC: What's your favorite story about Sophie? SM: Her father switching papers with a dead Italian man on the boat on the way over to America, the fear of religious persecution being so strong. And she didn’t sing in Yiddish, but her writer refused to let her record “My Yiddishe Mama” unless she did. She learned the phonetics, and it was the first million record seller in history. CTAC: What are your favorite songs form her repertoire and why? SM: I’ve got 60 years of music to choose from: Irving Berlin, the Gershwins, Cole Porter. Music from 1906 to 1966. Jack Yellen wrote all her special material, unique to her personality. CTAC: How much of her personal life shaped her performances and career success? SM: Every aspect of her life was an integral part for her success. She was motivated by her childhood poverty and took care of her family all her life. CTAC: How has performing this show helped you grow as a performer? SM: First, since Ii wrote it, it encouraged me to start writing again. I’ve been performing for over 40 years. I think my growth has come from the challenge of making something fresh every performance. Actually it’s easy with great material. CTAC: How can modern audiences relate to this show, about a performer who was most popular in the ‘20s and ‘30s? SM: You have your dates wrong. From the ‘20s until the day she died in 1966, she was very popular. Men loved her because she was risqué and woman loved her because she was liberated. She was booked at the Latin Quarter in Times Square for 28 weeks when she died. CTAC: And finally, tell us a bit about your time at Yale Cabaret and the Eugene O'Neill -- and developing the next generation of performers. SM: I teach what I sing, and I sing what I teach. Vocal contests on TV have taught singers some bad habits, but worse than that, have taught audiences incorrect responses to the music -vocal gymnastics or clapping when there is a key change – wrong!!! Why?? Because music instruction in our schools has been eliminated. Rhythm is an innate human response. We took the music away and were left with rap. Music teaches you mathematics and discipline. It brings joy to the spirit of anyone involved in it. Think of the countries or religions that don’t allow music in their culture. Red Hot Mama: The Sophie Tucker Story plays at Seven Angels Theatre, 1 Plank Road, Waterbury, through March 11. Performances are Thursday, Friday and Saturday at 8 pm; Saturday and Sunday at 2 and select Thursday at 2 pm. Tickets are $40-$55: sevenangelstheatre.org. It is the story of a woman - her professional triumphs and personal sacrifices during sixty years of survival in show business. Illustrating the contrast between Sophie’s on-stage persona, “The Last of the Red Hot Mamas”, and the real behind-the-scenes woman, it encompasses six decades of entertainment utilizing the original musical material that made Tucker famous. Stan Freeman Music Directs. Songs include “Some of These Days,”“After You’ve Gone,”and her so-called “naughty songs:” “There’s Company in the Parlor,” “Girls” and “Come on Down." Sharon McNight made her Broadway debut in 1989 in Starmites, creating the role of Diva, and receiving a Tony award nomination as “Best Leading Actress in a Musical” for her performance. The singer/comedienne’s regional credits include Amanda McBroom’s Heartbeats at the Pasadena Playhouse, and an award winning Dolly in Hello, Dolly! at the Peninsula Civic Light Opera. Sharon was Sister Hubert in Nunsense in Los Angeles and San Francisco, where she received the Bay Area Critics Circle award for her performance. McNight began her career in San Francisco where she received her Master of Arts degree in directing from San Francisco State. She taught a City College of S.F., has been a master teacher at the Eugene O’Neill Theater Center, and is on the faculty of the Cabaret Conference at Yale University. She has served as honorary chair of the San Francisco AIDS Emergency Fund. 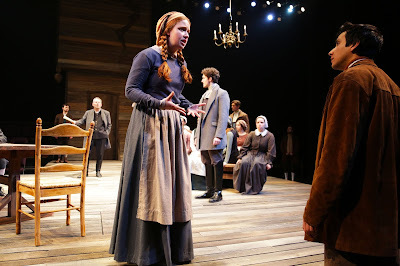 Carly Polistina as Mary Warren and Mauricio Miranda as John Proctor in THE CRUCIBLE by Arthur Miller, directed by Paul Mullins, onstage in the Nafe Katter Theatre at Connecticut Repertory Theatre through March 4, 2018. Tickets at crt.uconn.edu or 860-486-2113. Photo by Gerry Goodstein. Connecticut Repertory Theatre (CRT) begins the second half of the 2017-18 season with the Tony Award-winning classic The Crucible by Arthur Miller. Paul Mullins will direct. Performances will be held in the Nafe Katter Theatre Feb. 22 through March 4. When the daughter of the local reverend falls into a mysterious coma, the town of Salem, MA finds itself plunged into a state of suspicion and fear. The young women accuse citizens in the town of witchcraft. The lies spread like wildfire until it is too late to admit the truth. Written in 1952 in the wake of Senator Joseph McCarthy and the House Un-American Activities Committee, Miller’s classic tale of persecution and fear remains poignant and relevant today. Whose voices are heard in society now and whose are silenced? How does fear used as a political tool? When do lies have more power than the truth? Evening performances start at 7:30 on Wednesdays and Thursdays, and at 8 on Fridays and Saturdays. Select matinee performances are at 2 pm on Saturdays and Sundays. Tickets are $10- $33: crt.uconn.edu; 860-486-2113. The Olivier-winning musical based on the 1992 film starring Whitney Houston, whose catalog of songs highlight the story of bodyguard Frank Farmer (Judson Mills), hired to protect superstar singer Rachel Marron, who is being stalked by a threatening fan (a very creepy Jorge Paniagua). The night I attended Jasmin Richardson filled in for Deborah Cox in the role of Rachel. Richardson plays the role regularly at Saturday matinees and Sunday evening performances. You won't miss the star. Richardson is sensational. In the book, adapted by Alexander Dinelaris,, based on Lawrence Kasdan’s screenplay, Frank gets involved on a personal level with Rachel and her young son, Fletcher (the role is share by Kevelin B. Jones III and Sebastian Maynard-Palmer), which complicates the bodyguard's ability to protect the singer. Actually, the plot is rather weak and Frank seems like the worst bodyguard ever. Besides getting personally involved with his client, the stalker somehow manages to threaten Fletcher in his bedroom, attack Rachel's sister, Nikki (also an understudy the night I attended, DeQuina Moore) who has her own feelings for Frank and jealousy issues with Rachel. Oh, and the stalker also manages to trail the bodyguard and her family to what Frank believes is a safe house. And, oh yeah, Frank doesn't notice when a hard-to-get backstage pass goes missing. Hire me another bodyguard, please. The story, really, is just a mechanism for performing some great Whitney Houston songs under the Musical Direction of Matthew Smedal with vibrant choreography by Karen Bruce. The music fits naturally into the story of a musical legend performing concerts and in night club settings designed by Tim Hatley, who also designs the costumes. Duncan McLean's projection design, Mark Henderson's hard-to-take flashing lights and Richard Brooker's very loud sound (you will jump out of your seat at one point. . .) help the audience feel the concert atmosphere. Richardson's soaring voice and songs like "How Will I Know?," Greatest Love of All," "I Wanna Dance with Somebody." and "I Will Always Love You." Mills' karaoke rendition of "I Will Always Love You" is a hoot. 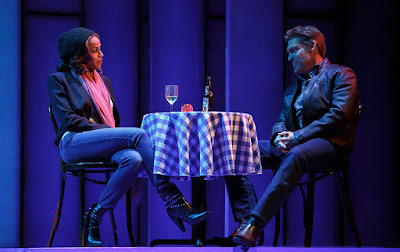 The Bodyguard plays at The Bushnell, 166 Capitol Ave., Hartford, through Feb. 25. Performances are Thursday at 7:30 pm; Friday at 8 pm. ; Saturday at 2and 8 pm; Sunday at 1 and 6:30 pm. Ticket ar $43-$119: bushnell.org; 860-987-5900. Adam Barabáš, Elyssa Jo Brown, Henry Byalikov, Megan Elyse Fulmer, Devinn Harris, Alex Jackson, Megan Melville, Kevin Mylrea, Stefan Raulston, Matthew Schmidt, Amber Snow, Lauren Tanner, and Naomi C. Walley. Orchestrations by Chris Egan, Musical Supervision by Richard Beadle, Production Musical Supervision by Mike Dixon.